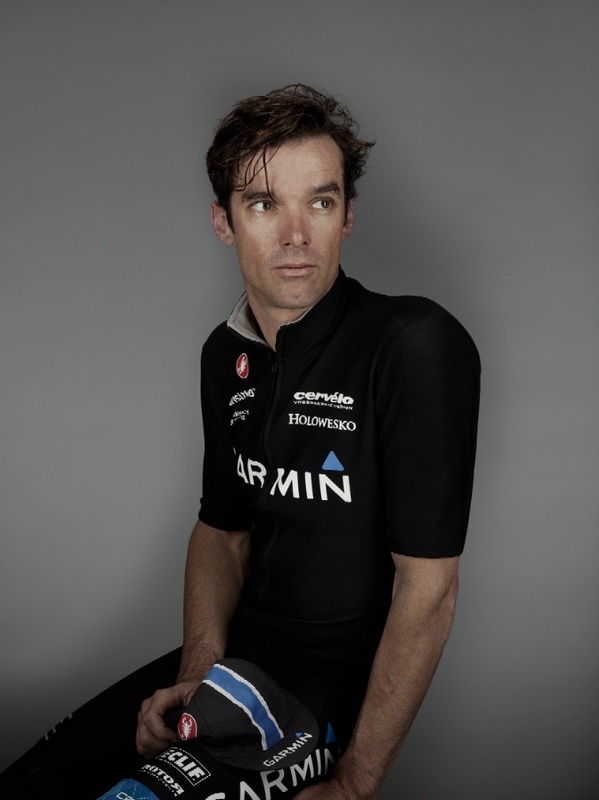 David Millar was the last of a dying breed. As a young British road cyclist in the late nineties, the only option to compete was to move to the continent to gain a Euro Pro Licence. This involved most probably living in France, struggling through as a callow 17 year old in a culture and language that was most probably alien. Eventually if all the stars aligned, you would get a contract as a domestique on a European team and have to tough it out in a peloton that predominantly spoke French and wasn’t particularly interested in helping a young Brit become competitive. Fast forward twenty years, to a post Lance/Wiggo/Froome world. The peloton speaks English and there are a plethora of non-European teams for a neo-pro to sign for – Sky (British), Orica Greenedge (Australian), MTN (African). 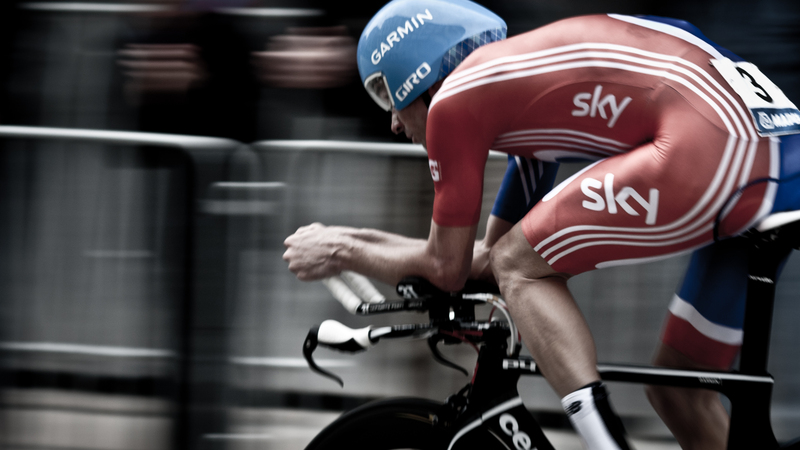 Millar retired in 2014, the last of the British cyclists forged in old ways. He’s back now with a burgeoning media career, a cycling clothes range and a new book – “The Racer”. 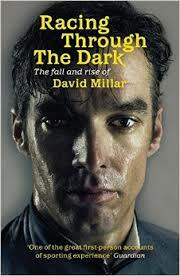 Millar’s story is fascinating. A child of the RAF, he grew up in Hong Kong, gravitating eventually to road racing. Despite a talent for art, he turned down a place at the Slade Art School to go to France and take the hard road into professional road cycling. He won a time trial stage of the Tour De France and wore the yellow jersey as race leader. He went on to win stages in all of the Grand Tours. However in 2004, the world turned upside down for Millar. He was busted for doping in the Cofidis clampdown. He eventually admitted to doping and was given a two year ban. The same old story as many pro’s of this era. This is where the road takes a fork. After a two year ban, Millar came back as an advocate for clean racing, a repentant anti-doper. Going further, he set up a road team, Garmin Slipstream, who voluntarily introduced many of the best practice anti-doping regimes that have now been adopted routinely by much of the Peloton. Millar is still unique in the degree of his commitment to reforming the sport. Many of his contemporaries simply took their punishment and came back silently. “The Racer” is Millar’s second book. His first, “Racing Through The Dark”, was entirely self written and was a fascinating but brutal account of his rise, fall and rise again. Millar described “The Racer” as his homage to racing, his love letter. I haven’t read “The Racer” yet but I can wholeheartedly recommend “Racing Through The Dark” to anyone who enjoys well written biographies regardless of an interest in cycling. 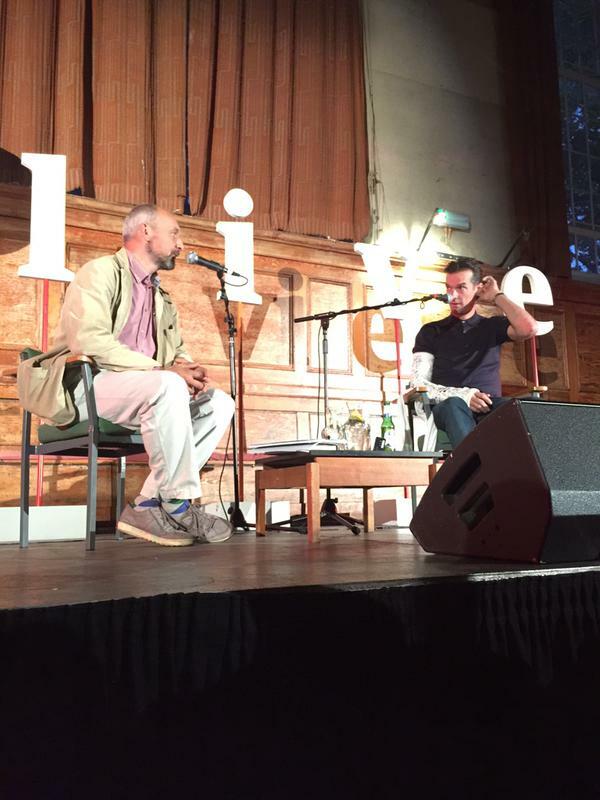 The topics covered during the evening stretched from the inevitable questions on doping, via Millar’s style and heroes, through to what happens next for him. The first business to get out the way was why his arm was in a sling. It turns out that Millar has two boys, Archibald (4) and Harvey (2). They both unsurprisingly have bikes and to keep pace with them, David has taken to skateboarding. He was out with them last weekend and saw out the corner of his eye that his youngest had stopped to smell the flowers whilst Archibald had ploughed on. He turned back again only to find that Archibald had skidded to a halt and Dad could do nothing but crash. 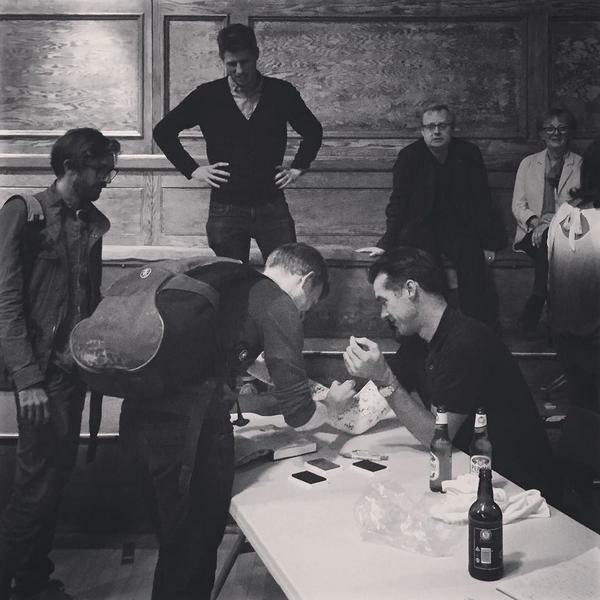 The break did though introduce a unique opportunity for a book signing whereby the author signed the book and the audience signed the cast. 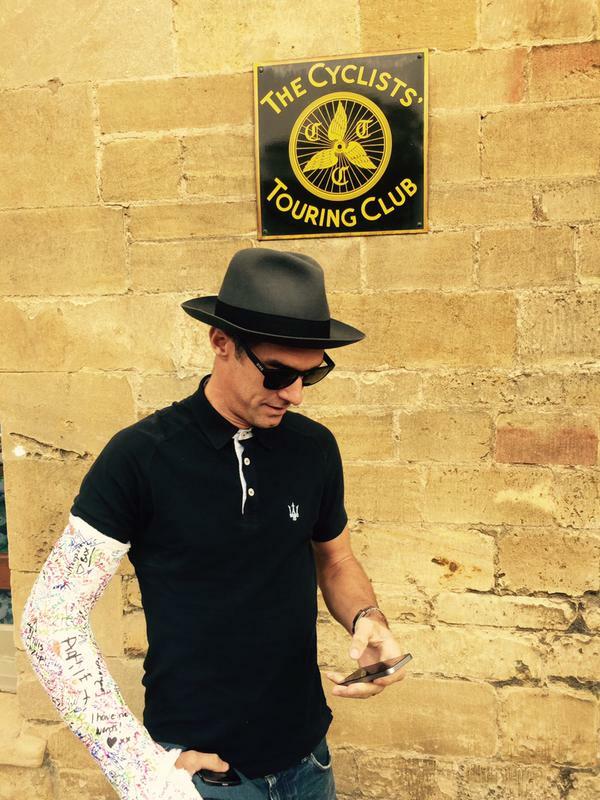 Millar seems to be enjoying his time away from competing. His first pop at commentary for ITV4’s Vuelta coverage was a success with his incisive observations adding to the event. He watches cycling as a fan now. He always has does though. He was asked what heroic performance he admired during his career. This is the one that he chose. It’s from the 2013 Vuelta and the world’s best time trial rider Tony Martin has been on his own for 170km of a 200km stage. It’s an extraordinary performance from Martin, who is probably the only rider in the world who is capable of riding like this. I’ll leave you watch what happens next. He was asked who his style icons were on a bike. 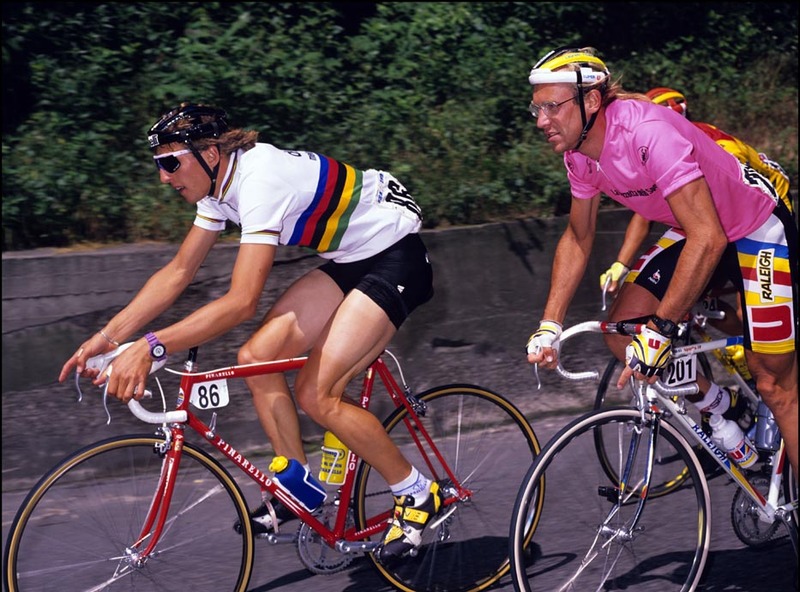 Millar liked Maurizio Fondriest back in the day and Alejandro Valverde currently. The worst stylist? Unsurprisingly Chris Froome, with his elbows out and his head lolling. He admitted to a slight man crush on Tom Dumoulin in this year’s Vuelta (he’s not alone there), especially for his immaculate time trial positioning in the saddle. He was chuffed that Peter Sagan had won the world championships and was less than complimentary about Vincenzo Nibali and his Astana Team. Millar was asked about cycling rules. The Rules are essential to cycling and woven into its culture. There are aesthetic rules (Rule#36: Eyewear shall be cycling specific, Rule#22: Cycling caps are for cycling) but there are also racing rules, such as “Thou shall not attack the race leader when he is having a mechanical problem. This is something that Nibali did to Froome in this year’s Tour De France and Millar didn’t approve. His description of race was anarchy without any form of on the spot governance. There is no referee or umpire to blow a whistle and adjudicate on an infringement. Therefore is it incumbent on the riders to self regulate. Millar insisted that the race rules are adhered to and I think he is right. For me, the evening captured why I love cycling so much, both a spectator and a participant. As a particularly crap footballer, cycling is a democratic sport. To go for a ride you just need a bike and the road. You don’t need to be picked. You don’t need to be coached. You don’t get to play in a certain position or role to the exclusion of everything else. Beyond the basic road sense and fitness, the world’s your oyster. Having been cycling for just over a year, I did my first rather modest sportive event last weekend, something from which I took a real sense of achievement and enjoyment. The one over-riding sentiment though was Millar’s enthusiasm and excitement for an era of clean athletic racing. I can see myself the wonderful array of young cyclists breaking through – the Yates twins, Rafa Majka, Esteban Chavez, Romain Bardet. Millar is optimistic and can see good times ahead. 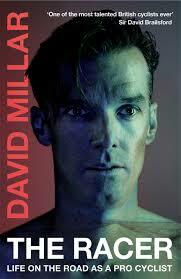 Love Millar and have read both the books. Sounds like an illuminating evening – wish I’d been there.